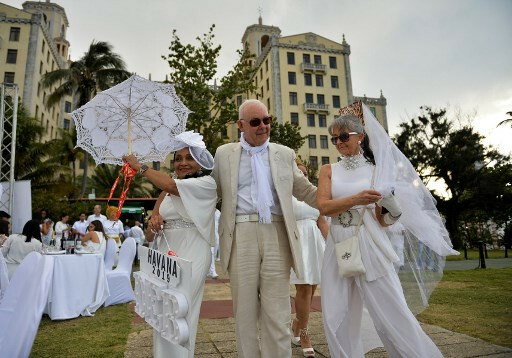 "Dressing in all white -- the ambience, the Champagne, the sparkles -- I love it," exclaimed Kay Barnes, who traveled from Florida to participate along with hundreds of other Americans in Cuba's first Dinner in White, a giant, chic, French-inspired picnic. Ignoring the diplomatic tensions between Havana and Washington, the event took place Saturday evening in the seaside gardens of the Hotel Nacional, a Havana landmark that once hosted the likes of Ava Gardner, Frank Sinatra and Marlon Brando. As per protocol, the venue was kept secret up to the last minute. Extravagant dress, masks and feathered hats were on display for the dinner, animated by an orchestra and more than 500 revelers, 80 percent of them Americans and most of the rest Cubans. "Look around," said Barnes. "It's beautiful, it's a sea of colors, a sea of nationalities, and it comes together here in Cuba. What a wonderful symbol of unity, and 'diner en blanc,'" the French for dinner in white, "makes that happen." At 43, Barnes is practically a professional attendee at these dinners, having participated in 47, including Saturday's. Originating in France, these picnics have become an international success, held in 90 cities all around the globe, including New York, Bangkok and Sydney. They were conceived by Francois Pasquier, who in 1988 had the idea of inviting his friends to a picnic in the Bois de Boulogne, the sprawling park on the western edge of Paris, with instructions to dress in white so that they could easily find each other. "The 'diner en blanc' was born because of the lack of space in my garden," Pasquier, who traveled to Havana just to attend this latest iteration, told AFP. Pasquier's son Aymeric, who also was in Havana, launched the international version of the event, first in Montreal in 2009, and then in New York in 2012. "It was a success and many other people wanted to do the same. So we decided to help them, and instead of trying to organize dinners in white all over the world, we gave them the right to use the trademark," Aymeric said of the growth of a franchise. In Cuba, there was an additional difficulty: most of the would-be participants were Americans, who cannot travel as simple tourists to the communist-ruled island. To qualify for travel to Cuba, the US guests had to participate in music or dance workshops as part of their visit. A travel agency offered them all-inclusive packages for about $1,000. Guests did not have to bring tables, folding chairs or plates, nor cook for the picnic -- they just had to choose from among several pre-paid menus. Initially scheduled for the end of November 2018, the dinner was postponed due to multiple cancellations by US participants spooked by Washington's hardening stance toward the island, which has been under a US embargo since 1962 and is under threat of new sanctions. But on Saturday night, the Americans arrived at the Hotel Nacional to wave the white napkin, the traditional signal for the start of the dinner. "There is a majority of Americans here, which is even more pleasing because they are historic symbols of unity: France, the United States and the Cubans, all seated around the same table: it's a beautiful symbol and a good blow to history," said Aymeric. Among the few Cubans at the dinner, Maricela Alvaro, 56, came with eight family members and said she was "fascinated." "It is marvelous," she added. Although prices were kept low for Cubans, Alvaro said that attending was "a sacrifice for the whole family," in a country where the average salary is $30 a month. But she was delighted to see Cubans mingling with Americans. "You have to build the future," she said, "not live in the past."